In recognition of their many charitable acts including their work in support of the Annual U.S. Marines Toys for Tots Drive. Nassau County, NY - December 24, 2014 - Nassau County Executive Edward P. Mangano presented a citation to Angela Anton and Anton News in recognition of their many charitable acts including their work in support of the Annual U.S. Marines Toys for Tots Drive. Joining County Executive Mangano in commending Ms. Anton was Ret. Maj. Chuck Kilbride, U.S.M.C. who has been the leading Nassau County’s Toys for Tots Program for over 20 years. 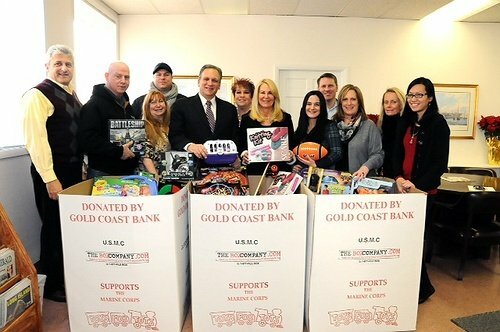 “This year due to the generosity and support of people such as Angela Anton and her staff, Toys for Tots will continue to be able to make the holidays a bit brighter for the many families in need here on Long Island,” said County Executive Mangano. Subject: LongIsland.com - Your Name sent you Article details of "Mangano Honors Angela Anton & Anton News"